Pressure washer pumps are an essential part of the pressure washer because it is the part that puts the power into the water to help you clean the area. There may come a time when you will need to change the pump on your pressure washer to help it work more efficiently so that you can get your job done. Finding the right pressure water pump for the size of your pressure washer’s engine is essential, because you do not want to damage the engine of your pressure washer, as that would cost you more money. Proper maintenance on your pressure washer pumps is an important part of keeping your pressure washer working efficiently and reliably. Making sure that enough oil is in the pump will keep it working smoothly. Lubricate it as directed to make sure that all of the parts can work smoothly and with even wear. Inspecting the hoses and the pump parts will help you to ensure that it is working correctly, so that you can get the maximum value from the pressure washer pump. By maintaining the pressure washer pump, you can make sure that it will work when you need it to. During the cold, winter months, it is important to winterize your pressure washer pumps to help keep them working when you need them. This will entail flushing the pump with fresh water, turning off the power supply so that you can remove any water from the wand, and running a dilution of antifreeze and water through the pump to help decrease the chance of freezing inside of the pump. After you do this, you will want to cover the pressure washer to help keep it from direct exposure to the cold weather. This may not be necessary if you do not live in an area where it gets cold, but if you see freezing temperatures, then you will want to make sure that you properly winterize your pressure washer pumps. If you begin having problems with your pressure washer, then consider the fact that you may need to replace the pressure washer pump. From COMET high pressure pumps to CAT high pressure pumps to General high pressure pumps, you are sure to find the right pressure washer pump for your particular needs and pressure washer. 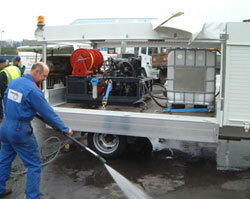 You will need to know the horsepower of your engine so that you can make the right choice in pressure washer pumps. If you want to keep your pressure washer working efficiently and with as much power as possible, then taking care of your pressure washer pump is essential. From maintaining it on a regular basis as dictated by the manufacturer and winterizing it if necessary, you can keep your pressure washer pumps working as powerfully as possible by taking care of it. If you need to replace your pump with one of the many pressure washer pumps that are available, then you can choose the one that works best with your pressure washer’s engine and your needs.